Dedicated to those who have lost their lives working for Arizona’s wildlife resources. In the decades since the advent of modern wildlife management, seven Arizonans have lost their lives in the line of duty in our state. The Wildlifer Memorial Garden ensures that their sacrifices are never forgotten. Six deaths were associated with aerial flights, the main cause of death for wildlife-related jobs nationwide, one death resulted from a motor vehicle accident. William (Bill) Edwin Smith. Wildlife Technician. Bill was a new wildlife technician for the Arizona Game & Fish Department. He had recently moved to Arizona only a month earlier from California, where the 28-yr old had completed a wildlife management course. Bill died along with pilot Ross Moores on February 19, 1949 in a small plane crash between Williams and Perkinsville. They were attempting to feed wild turkeys trapped in the area by snow after a series of major storms blanketed northern Arizona. Ross Moores. Pilot. The 39-yr old pilot and wildlife technician for the Arizona Game & Fish Department died in a small plane on February 19, 1949, along with wildlife technician Bill Smith. Ross was both a pilot and wildlife technician for the Arizona Game and Fish Department. He and wildlife technician Bill Smith were completing an emergency turkey feeding flight after a series of major snow storms across Arizona’s high country. Ross had moved to Phoenix from his birthplace of Okmulgee, Oklahoma in 1936. Donald Miller. Pilot for Anderson Aviation Company. Don was a contract pilot with Anderson Aviation Company assisting the Arizona Game & Fish Department and the U.S. Fish & Wildlife Service conduct waterfowl surveys. Donald Miller died in a plane crash on January 4, 1954 in Apache Lake. He and Waterfowl Biologist Wes Fleming of the Arizona Game and Fish Department were conducting waterfowl surveys during the morning and hit a steel cable that spanned across Apache Lake. Fleming was able to escape the plane as it was sinking into the lake. Donald was not able to escape and perished in his aircraft. Allen (Al) Severson. Wildlife Manager. Al was a 11-yr veteran of the Arizona Game & Fish Department at the his time of death. The 34-yr Wildlife Manager for the Pinetop District started with the Department in 1969. On February 7, 1980 Al died in a helicopter crash during an elk survey flight near Alpine. The pilot and another observer escaped death after the aircraft hit a power line. In Al’ s memory, The Commission and Department dedicated the Allen Severson Memorial Wildlife Area at Pintail Lake, a prime waterfowl nesting area, on September 18, 1982. Richard (Rick) F. Seegmiller. Ph.D. candidate. Rick was a Ph.D. candidate at the University of Arizona’s School of Renewable Natural Resources, studying desert bighorn sheep in the Harquahala Mountains near Salome. The 31-yr old had previously completed his Bachelor of Science degree in wildlife management and a Masters of Science in Zoology at Arizona State University. He was already well published and respected on the ecology of desert ungulates, particularly bighorn sheep. Rick died on February 6, 1983 in a small plane crash in the Harquahala Mountains when he was radiotracking the collared sheep. The pilot and another observer on the flight escaped fatal injury in the crash. Estevan Escobedo. Wildlife Manager. The 34-yr old Wildlife Manager for the Arizona Game & Fish Department was a 10-yr veteran, joining the Department in 1984 after graduating from the law enforcement academy. Estevan died on January 4, 1994 during a deer and javelina survey flight near Winkelman. The helicopter, out of Southwest Helicopter in Tucson, hit a power line in the rugged mountains between Winkelman and Coolidge Dam. The pilot and two Department observers escaped fatal injury. Estevan was the Wildlife Manager in Globe for six years, and previously in Bullhead City and Casa Grande. Born in Mesa, Estevan’s early interest in falconry resulted in a chance encounter with an old game ranger, and fueled his desire to work for wildlife. In Estevan’s name, an award was created in 1994. The Estevan Ortiz Escobedo Citation of Honor is awarded to dedicated professionals of the Arizona Game & Fish Department in recognition of acts of heroism, bravery, or valor in support of the Agency mission. Mark Whitney. Fisheries Biologist. Mark was a Fisheries Biologist with Coconino National Forest in Flagstaff. He died April 27, 2004 of injuries sustained in a motor vehicle accident enroute to Fossil Creek for a meeting on renovation and restoration of the creek associated with decommissioning of the Childs and Irving Power Plants. Mark was passionate about the Fossil Creek restoration project, which provided a rare opportunity to restore stream flows and native fish to one of Arizona’s few perennial streams. Mark worked tirelessly on planning and compliance documentation for the project. In addition, Mark worked closely with high school students, involving them in conservation activities and including them on field trips to Fossil Creek. A native of Arizona, Mark had worked for the Forest Service for 32 years at the time of his death. 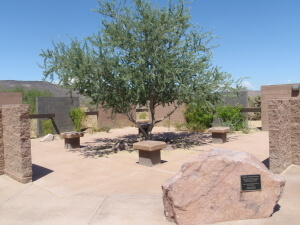 When you visit the Phoenix office of Arizona Game and Fish on Carefree Highway, be sure to take a few minutes to enjoy the Wildlifer Memorial Garden, and to remember those who have lost their lives doing their job working for wildlife – a job that many of us share, find important, and hopefully enjoy. 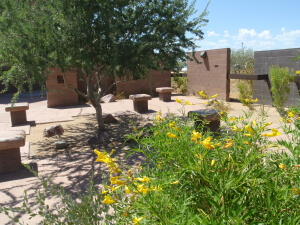 The Wildlifer Memorial Garden concept was conceived and developed by members of the Arizona Chapter, The Wildlife Society, in the 1990s. Cooperators included Arizona Game and Fish Department, Arizona – New Mexico Chapter American Fisheries Society, Arizona Game Rangers, and others. 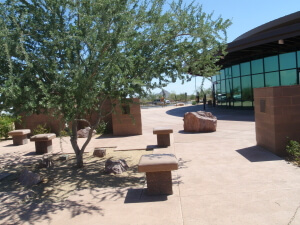 The Garden was originally dedicated in 2003 at the Arizona Game and Fish state-office on Greenway Road in Phoenix. When Game and Fish moved to the new Carefree Highway location in 2007 a new Garden was created as an integral part of the planning and construction of the new facility. Arizona Chapter TWS has been the leader in fund raising for the Memorial Garden since its inception. Originally, donations were encouraged through purchase of engraved bricks, approximately 70 of which were incorporated into the original garden. 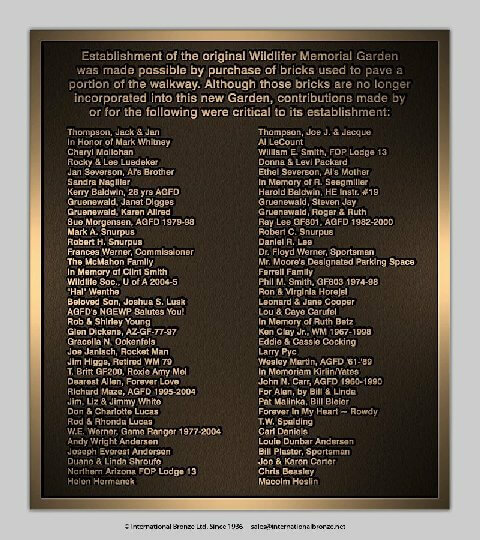 Bricks were not incorporated into the new Garden at Carefree Highway, but all prior donors were noted on two bronze plaques installed at the Garden. Currently donations are being accepted, though not actively pursued, because Arizona Game and Fish handles maintenance of the garden as part of their overall complex maintenance. Occasional funds may be needed for purchase of memorial plaques, but hopefully this will be very rare. The Wildlifer Memorial Garden is dedicated to individuals who have lost their lives while working for Arizona’s wildlife resources. 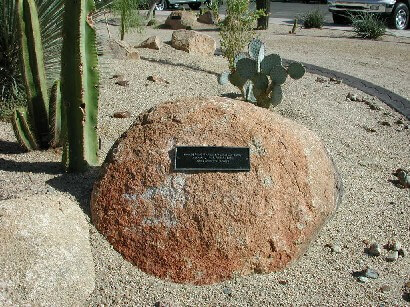 At such time that a person dies while working for Arizona’s wildlife resources, consistent with the mission of The Wildlife Society, or through written petition to the Arizona Chapter of The Wildlife Society Executive Board, a seven member temporary board shall be established to decide upon the eligibility of that person for inclusion into the Wildlifer Memorial Garden. The seven member board shall consist of a peer representative of the deceased (e.g., student -student; agency biologist -agency biologist), four members of the Arizona Chapter of The Wildlife Society, and two members of the Arizona Game Rangers Lodge FOP 71. These representatives shall be chosen by the executive board of each organization with the goal of broad -diverse representation, and a timely decision. The Mission of the Wildlife Society is to enhance the ability of wildlife professionals to conserve diversity, sustain productivity, and ensure responsible use of wildlife resources for the benefit of society.